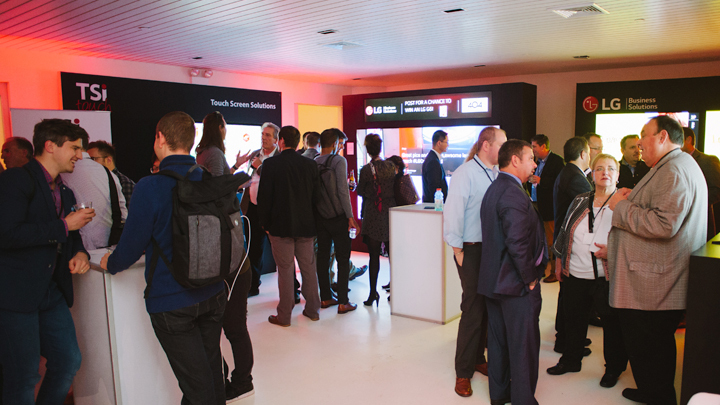 October 30 – November 3 was New York Digital Signage Week, bringing together industry leaders, media owners and planners, creative agencies, retailers, architects and investors, all looking to experience the latest and greatest digital signage has to offer. We were there on Thursday, November 2, at 404 Studios for our final roadshow of 2017. Doors opened at 7AM for an energizing event including a delicious breakfast and lunch, plus a comprehensive keynote on 4K by Gary Kayye, founder of rAVe [Publications]. At 4PM we transformed the show into a relaxing four-hour cocktail reception with music provided by NY hotspot DJ Carol C, along with plenty of passed hors d’oeuvres and ultra-fresh oysters—shucked and served on the spot. It was a huge turnout. A vertical pillar configuration of four 86-inch Ultra Stretch Displays stopped attendees in their tracks and showed them the menus and agenda for the day. LG Technology Partners also showcased their offerings, ranging from digital media players to digital signage software to AV mounts, touch screens and protective overlays. Their links are below. If you were there, have a look at our photo album. If you weren’t there, have a look at all you missed. We had an amazing time. A big SHOUT OUT and thank you to Gary Kayye, our technology partners and all our guests for making the 2017 roadshows a major success. See you next year.